Kim hyun Joong revealed in Japan : " Hope to hold a concert together with SS501 in Tokyo dome"
5 Sept, at National Convention Hall of Yokohama, during the promotional activity, "Flower boy" Kim Hyun Joong disclosed his aspiration for his involvement in Japan and also what he want to do with his girl friend, making the 4000 audiences laugh non stop. During the event, somebody ask him: "Do you have any experience like in "Flower boy", working part time job personally, have you been through any hardship?" He replied: "I had once delivered newspaper, worked in pizza shop, hamburger shop and many other places." "If you have a girl friend, what is the present you want to give her?" Hyun Joong's answer was : "KISS", making all the ladies audience around surprised. When asked what is his dreams or aspirations, He answered : "Tokyo Dome". Gaining a lot of attention from everybody around. 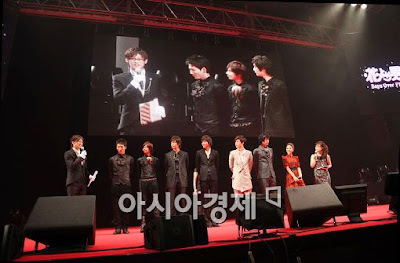 Followed by that he explained: "I wish to hold a concert together with SS501 members in Tokyo Dome." immediately getting continuous applause from the audience. He further explain that though they had held a concert in Japan Bodukan, but he would prefer to hold a bigger scale concert in Tokyo Dome, and wish to carry out larger scale promotion/publicity." This fully shown his capability as a team leader. During the day, among Lee Min Ho, Kim Jun, Kim So Eun, Im Joo Hwan, and other participants, Kim Hyun Joong was the only participant who could converse in Japanese fluently. He could clearly express his opinions and thus received great responses from his fans. A person who has closed relationship with him revealed: "Seemed like he had earnestly learn Japanese. In order to hold activity in Japan, it is important to understand the native language. He seemed to like it." Thank you, namikero and YT !